Maybe it’s the Courier part two, a new member of the Surface family, or the long-rumored Surface phone, but whatever is being shown in a recently discovered patent filing by Microsoft looks pretty interesting. 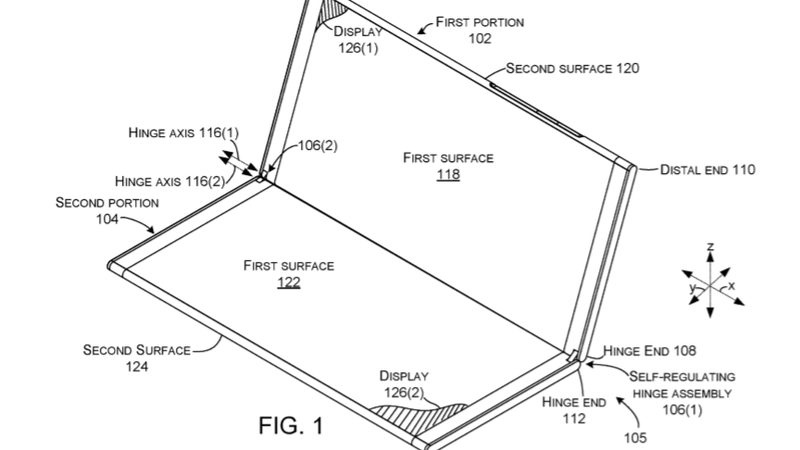 Filed by Microsoft earlier this year, the patent describes a device with reversible hinges. But a few sections in the document also describe how such a device could include a processor that would generate different interfaces for a device’s multiple displays. That’s right, not one, but two displays that could be folded open and feature touch support. In essence, this would take the concept behind Lenovo’s Yoga Book to a new level, letting you use one touchscreen as a traditional display while the other serves as a giant touch-enabled keyboard, a custom control pad, or anything else Microsoft could program it to do. There’s even a drawing in the patent filing of what this might look like. The one thing that’s missing is any mention of stylus or pen integration (like the Courier had, RIP). But seeing as how Microsoft has pushed Windows Ink support onto a wide range of systems this year, it’s possible a device like this could include that sort of functionality. And because it’s just a patent, it’s also possible the technology described here will never make it into a finished Microsoft product at all. I gotta say, I love the arrow pointing towards the user. Alternatively, website MSPoweruser points out that this could also be a prototype for the Surface Phone, as the displays look small enough to make this system somewhat pocketable. While the patent filing didn’t get published until yesterday, Microsoft actually applied for it back in October of 2016, which means a lot of development could have taken place over the last 14 months. I’m just hoping it didn’t get canned.